I dont' think there is any better 'vehicle' for gravy, jam, whatever, than a biscuit. These were good, wern't they? alton brown cracks me up. he is awesome! baby strawberry looks soooo cute too! We love Alton too! 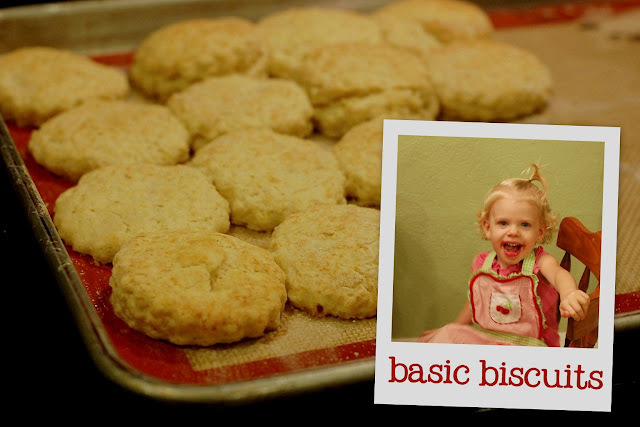 your biscuits look delicious - glad the kids are better - your little one is a treat! I love Alton's take on biscuits - always hilarious. Your biscuits look great, and clearly were enjoyed by everyone. I think Alton is my favorite! He's even funnier than Julia, and she was so down to earth she was hilarious. It was fun watching this episode with his grandma again. Love cute baby strawberry, what a sweetie! My guys think biscuits are a vehicle for gravy! Dories recipe is a good one. I'll have to watch the Alton Brown episode. Your biscuits look perfect. Thanks for baking along with me this week!